For disadvantages of sand making and production by traditional machine including low quality of finished products, serious environmental pollution and high investment cost, zenith as a model enterprise in domestic sand making industry fulfills social responsibility actively, focuses on research and development engineers and develops top sand making system independently-VU aggregate optimization system. The system applies dry sand making process and solves problems existing in traditional wet sand making perfectly. 1. VU impact cutting: New grinding and shaping function in new impact cutting can remove needle flake material effectively and sharp corners in the sand so as to improve grain shape of finished sand significantly. 2. VU mode control screen: Screening is combined perfectly and fineness modulus is controllable. 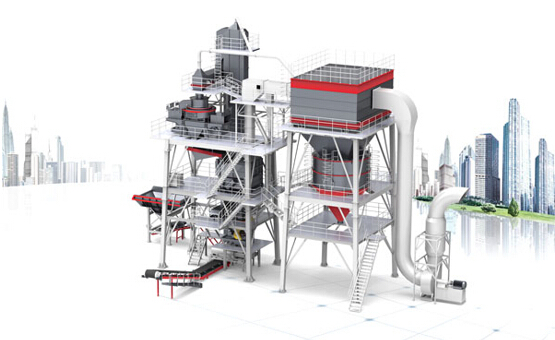 It combines mature idea of crushing and screening and powder selection in the mill. Based on the design of whole close, powder removal by negative pressure and uniform screening, it completes the task of material screening and stone powder removal excellently in one equipment at the same time. It improves production efficiency greatly. In addition, the problem of traditional wet screening including fugitive dust and silt treatment does not happen. Automatic control design makes sure stable water addition. It makes water content of finished sand qualified, composition uniform and difficult to form segregation. Negative pressure dust collector is used and sealing operation in full flow is combined. It includes transportation process from fine ore bin to powder tank car. It makes sure no fugitive dust on site. Environmental protection index reaches national standard. The world's first efficient grain shape optimization technology follows formation process of natural sand. It applies the world's first “low energy crushing and shaping technology” and “cascade milling technology” to remove the burr and residual corner on the surface of standard finished product effectively. Furthermore, it can increase -0.6mm fines and realize optimization of gradation and grain shape once again. Porosity reduces 1%-2% and flow time reduces 5%. It can set and maintain optimal operation parameters rapidly, make product quality reach stability and realize maximized state of production capacity. In addition, it makes overall system efficiency maintain in highest level. VU system composed of six modules leads the revolution in sand making industry. Every index of VU sand conforms to GB/T14684 and JGJ52. In addition, it can be adjusted according to application requirement. It can realize regulation of fineness modulus in 2.0-3.5 and powder content in 3-15%. As a result, it meets the demand of sand stone in construction industry furthest.